Photo courtesy of Graeme Hayes. Found on a menu in Bangkok, Thailand. This place looks pretty crappy, it must be the crap place! The dog crapped on my spicy cello phone noodle salad, and now I am steaming mad because I stepped in it. How much is the crap with green sh*t? – Can I have an iPhane, please? I’m sick of cellos. Yeah, speaking of barking with crap? My mother-in-law called me on my cello phone noodle last night. I thought the crap supplied its own steam. I’ll have a steaming pile of lunch, please. Oh, I see the misprint. It should say “Cellophane poodles”. Waiter! These noodles tried to hump my leg! I think they are feeding their dog the wrong way. It takes talent to make the cello bark. With cellophane noodles and marshmallow crap. Sounds like crap to me, too. Would you like a second yelping? Actually, such thing as cellophane already exists. It’s what some transparent packages are made of. AnAAANNND. …(*singing*) You can get anything you want, at Alice’s Crapteraunt! Did you say : “Don’t gulpa your mea”? Speaking of “barking crap”. We have a state election in Qld. this month. what’s that, lassie? timmy took a number two? That settles it. 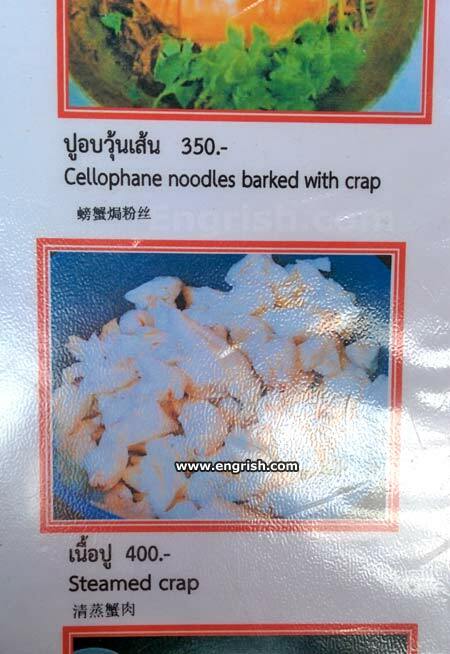 Next dog I get will be named Cellophane Noodles.